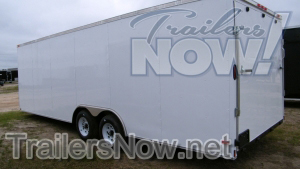 Searching for a quality enclosed cargo trailer for sale to be delivered to Arkansas? If you buy factory direct from a wholesaler like Trailers Now Trailer Sales, you’re ensured to get a great enclosed trailer at an unbelievable price. We are a volume seller with an objective to provide high-quality trailers at an irresistible price, and we transport throughout the state of AR. Many enclosed trailers for sale in Arkansas will not come with a 5 year manufacturer’s service warranty, and there’s no guarantee that they’re constructed with a tough steel-tube main frame supported by a reliable plywood interior– standard features at Trailers Now Trailer Sales. Do not take any risks with small time trailer sales, buy factory direct and save as much as countless dollars with a fast and easy deal. Trailers Now Trailer Sales has trailers ready for pick up in Douglas, Georgia, but we routinely deliver enclosed trailers all over the state of AR, so no matter where you require your trailer, we’ve got you covered.